The Wickedly Sweet Paper Pumpkin Kit from Stampin’ Up! is such a wonderful box full of fun for September 2015! The kit contains all of the products that you need to make eight fall/Halloween treat bags. I showed you on my blog post HERE that you can also use some of the pieces from the kit with a few additional supplies to make a monster and a gift card holder. Check out my YouTube video below where I explain how to make these alternate projects. They are really easy! The extra supplies are listed below the video. Have a great weekend! I hope you have lots of stamping time planned!! Every month is a different surprise! Who doesn’t love surprises? The kits contain EVERYTHING you need to complete the project! After you complete the project, you still have a Stampin’ Spot AND a stamp set!!! Such a great value! As I have shown you, you can use your creativity and make other things with the items that come in the kit. Create, create, create! 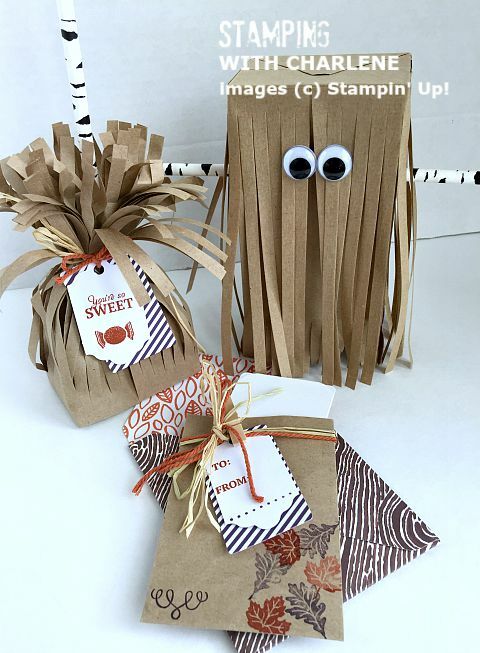 Did you make anything different with YOUR Paper Pumpkin Kit? If so, leave us a link to your blog in the comments! 2015 Stampin’ Up! Holiday Catalog is HERE! Halloween Treat Bag: Happy Haunting! Spider Web Doilies from Stampin’ Up!